Nvidia’s Titan V graphics card is capable of running ray tracing at surprisingly fluid frame rates in Battlefield V, according to some new benchmarking results which have popped up online. 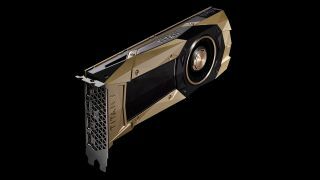 You may be surprised that a non-RTX card from Nvidia’s Volta-powered range is capable of dealing with ray tracing at all, but theoretically, there’s no reason why any given GPU can’t cope with implementing ray tracing. It’s just that doing it in real-time is a highly intensive task, and Turing’s RT cores are designed to make (relatively) light work of this (pun not intended) via hardware acceleration. Indeed, developers were running ray tracing on last-gen cards (using a software fall-back layer emulating the DirectX Raytracing API) to test out and experiment with the technology well before the GeForce RTX range emerged. And what’s more, the Titan V may not have RT cores, but it’s a very powerful GPU which actually has more shader units than the Titan RTX: 5,120 as opposed to 4,608, which seemingly helps the cause when it comes to dealing with real-time ray tracing. So perhaps it isn’t surprising, then, that 3DCenter.org forum denizen TobiWahnKenobi found the Titan V was able to hit 80 frames per second (fps) in the Fjell 652 map on Battlefield V, on ultra details with ray tracing set to high, compared to 87 fps for the Titan RTX. That’s only a mere 7 fps slower than the Turing card, a pretty impressive result – but then, as Wccftech (which spotted this) points out, that particular map is a snow-fest, and there aren’t many reflective surfaces around (so it’s less taxing in terms of ray tracing demands). On the Rotterdam map, the difference between the two cards is more pronounced, with the Titan V hitting 56 fps with ray tracing on high (and ultra details) compared to 81 fps for the Titan RTX. And with ray tracing on medium, the last-gen Titan managed 67 fps compared to 97 fps for the Titan RTX. Even so, these are still impressive frame rates, but obviously we need to take the report with a pinch of salt until we get further confirmation – and indeed, we shouldn’t get too carried away with these observations anyway. Remember that we’re talking about a hugely expensive graphics card here, and other non-RTX GPUs aren’t nearly as powerful and therefore viable for ray tracing. The Titan V is really aimed at professional usage – AI and scientific research applications, as opposed to gaming – and costs an eye-watering £2,800 or $2,999 (or AU$4,699). And also, as developers work with ray tracing and push the boundaries further with more demanding implementations, a non-hardware solution will increasingly fall behind on the performance front, even on a GPU bristling with shader units like the Titan V.
In other words, the future is definitely RTX, or equivalent ray tracing hardware acceleration technology (which we expect to see from AMD at some point down the line, although it’s far from clear when).